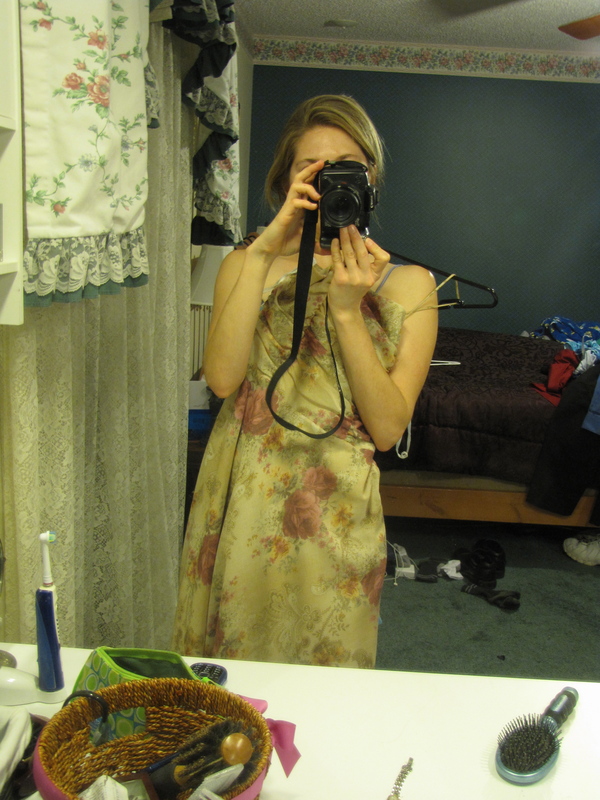 I found this old dress, a relic from high school senior pics, a few days before traveling to Minnesota for my cousin’s wedding. Though more than ten years old, it seemed appropriate to wear. The posture of this photo is one I feel I took at the wedding: a faceless photographer–capable of participating only as outside observer. I should have brought Kleenex. I always cry at weddings; I knew this. But I was not prepared for the emotions unleashed at my cousin’s wedding Saturday. Not only the customary tears for a budding union, but I cried regretful tears for all that I had missed over the years. You see, I moved 1,000 miles away from all of this, and all of them, eight years ago. Faces from my past swarming around me, coming at me in waves, breaking through some icy barrier I’d built. There were old classmates, old classmates’ parents, and even a former teacher. I wanted to cry just for seeing them. I did. In the past, what had I imagined of such a reunion? In my teen years I was very conscious of at first having to hide things. Later on, when it would have been okay to share, I still mostly hid, out of habit. To the point that I disappeared from people’s lives. Standing with two former friends at the wedding and hearing them banter like they were not just past, but present, friends, hit me in the gut. Soon I wasn’t even standing there. And I realized I had done it. I had erased myself from memory. I excused myself for the bathroom. But then, selfishly, wondered if maybe, just maybe, they were talking about me. Sad to say, I’m just beginning to realize how self-centered I’ve been all these years. Always thinking about my feelings—protecting myself. The fewer people I’m close to, the fewer who can hurt me—was my unwritten, unspoken motto. As I see faces from my past swimming at me, I now feel it was all a lie. The face of an old teacher’s aide—from my first grade classroom, nonetheless—exclaiming, “Is this Lindsey?! She’s turned into such a beautiful young woman!” A mother of a classmate, gasping, exclaiming my name, and enfolding me in a hug. My sixth grade teacher’s face lighting up as she asks, “Are you writing?” Yes. “Oh good; I always thought you should!” An ex-boyfriend’s mom even engaging in friendly talk as she never did while I dated her son. My cousin’s, the groom’s, exclamation: “Lindsey, what an awesome surprise!” My old friends, C and T, who married each other, taking time to talk with me over an hour as if they had nothing better to do. “It’s so good to see you!” they say (and mean it, I think). It has been about eight years. Another old friend looking in my eyes and, to my small talk, saying, “Being away from home must be the hardest part.” Understanding for the words I could not speak. Desperately I snap pictures of my young cousins and their spouses and children, laughing and talking at neighboring reception tables. They too are familiar, comfortable, with one another. And like my classmates, they have passed through many of the same coming-of-age events as I, only together. There’s something comforting about a shared heritage. But I have refused to be comforted. This visit has once again touched me where it hurts…still, thankfully, it has been different. Like the Minnesota snow I left behind last night, something in me is thawing. As much as is possible from 1,000 miles away, in the future I’ll try to be less of a stranger.